No you didn't read that wrong, robots washing hair. We are forever hurtling towards an age of machines taking over, from production lines to cleaning it's likely a 'robot' is involved. 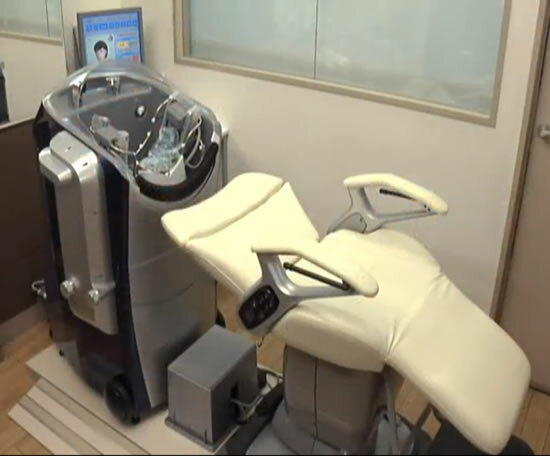 Now the salon junior could be replaced with a robot from Panasonic. The robot has 24 digits, 8 on the right, 8 on the left, 8 under the neck. It gauges the precise shape and size of the head and away it goes. Not only giving a hair and scalp wash, but also conditioning the hair, along with giving a head massage. Obviously they would have to make sure they ironed out any problems the robot may encounter - no one wants to get tangled up in a machine. Watch the trial below to watch the robot in action. At the moment it's not clear when the robot will be arriving in salons in the UK, Panasonic are apparently keen to move forward for commercial use. What do you think? Is the robot wash for you? He he, this is like something out of an old TV show of what they thought we'd have in the year 2000!